Here. Forward. 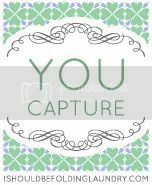 : You Capture: What inspires you? One thing that really inspires are all of the awesome photographers and photography blogs I have discovered. Chances are if you are reading this then YOU are who I am talking about. Aside from participating and sharing photos in the many challenges out there I have been inspired to move outside of my comfort zone with my photo editing. I use Picasa which isn't very fancy but I tend to always use the "feeling lucky" button and then one click on "sharpen." So, this week while I was waiting in the car for one daughter to finish her piano lesson, I snapped a picture of my oldest daughter's first grade reading beads. I thought it was the perfect picture to venture out with some enhancements that I normally wouldn't use and share. Thanks to all those creative and artsy people out there who are so generous to share their experiences, secrets, and photos I have learned a thing or too and have found some great communities of photographers who support each other! And most importantly, I like what I came up with! Thanks for the inspiration! What a really petty capture. Wow, that necklace(? not quite sure what reading beads are) really photographed well,love the way the beads captured the light! That certainly made for a lovely photo! What a beautiful necklaces - makes for a beautiful photo. Beautiful photo, I love the colours and the light shining through the beads! Love the bright colors! But I have to ask, what are reading beads? Thanks! In first grade the kids count and track the number of books they read by adding beads to their necklace each month. Once they reach a certain number they can choose sparkly beads. Those are my favorite ones. Very, very cool picture! You did great with editing. I also edit with Picasa. I have Photoshop Elements but haven't spent enough time on it to learn how to use it. BUT I LOVE PICASA and I love Picnik too. This is beautiful. Happy YOU captured that. I love the picture, too. I too use Picasa but want to learn Photoshop one of these days. After learning how to use my new camera, that is. You've got a new website design! It looks wonderful. I love how the beads catch the light. I have PSE but I use Picasa all of the time too. My main goal is to capture the best photo I can out of my camera so I don't have to edit at all. I think it's because I find Photoshop to be so difficult to learn. Editing is something that I'm still new at and don't do a whole lot of, but it's fun to play around with it. I like what you did with the picture. What an awesome idea (and photo). I need some reading beads!